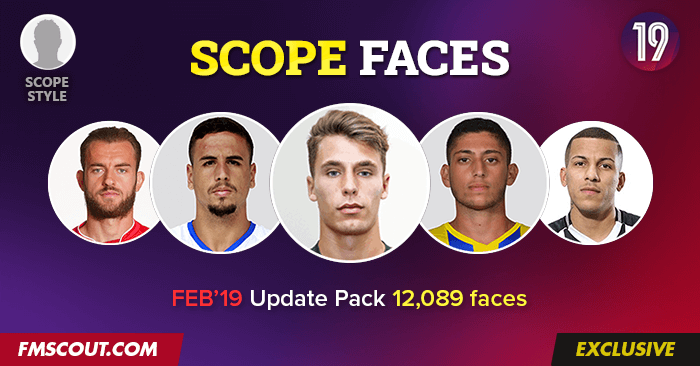 Our scope style facepack includes over 120,000 faces of players, staff and referees for all playable leagues on Football Manager 2019. It's a sleek and modern circular portrait style in standard size of 180x180 pixels. It is intended for use with FM 2019, but it will work with all versions of the game from FM09 onward. Scope style is originally created by fmscout.com and its production started in February 2012. The Scope faces 2019 collection has been repacked as one megapack and first became available on October 10th, 2018. You are welcome to share this pack on other sites. All we ask is to give us credit and link back to this official page. 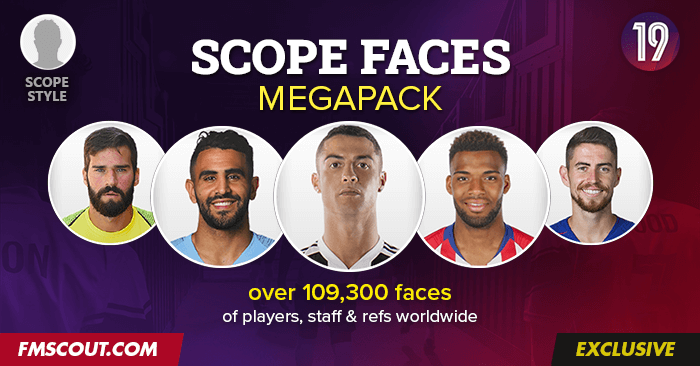 Scope Faces Megapack 2019 base pack contains a total of 109,360 faces and takes up 5,23 GB of space. With the monthly update packs, the collection extends to 120,443 faces and takes up 5,98 GB of space. Currently the "Download Now" big red button points to the torrent file. You need a torrent client to use this and download the actual facepack. I personally recommend qBittorrent. Please be kind enough to help with seeding once you download the pack, so that more people will be able to download it fast. Bittorrent networking is the most popular form of P2P (peer-to-peer) file sharing. Bittorrents (also known as "torrents") work by downloading small bits of files from many different web sources at the same time. You need a Torrent client in order to open a torrent file and start downloading via peer to peer network. Be warned that in certain countries you might encounter a download limit after downloading a couple of GB. If this happens, you can bypass it by resetting your modem/router or using a VPN. Open Football Manager 2019 (or Touch) and go to Preferences > Interface. There should be a box that pops up saying 'loading image data for the new skin'. Once this is done scope facepack should be working within the game. The 1st update pack contains 4675 faces of players and staff. Includes DF11 October update (minus 35 pics) plus around 340 extras. Thanks to Ukrainian_Fanatic for providing 270+ pics for this update. The 2nd update pack contains 12089 faces of players and staff. Includes DF11 updates of November, December and January (minus certain pics) plus a few extras. Thanks to Gary and to BowserPride for providing the extra pics for this update. 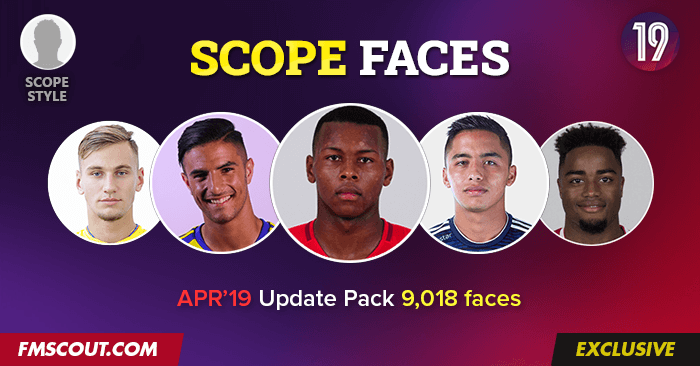 The 3rd update pack contains 9018 faces of players and staff. Includes DF11 updates of February and March (minus certain pics) plus a few extras. Thanks to Gary, BowserPride & haha945 for providing the extra pics for this update. To install November's update, extract the .zip file you downloaded and move all files inside the "Scope Faces - 2018 November Update" folder to your "Scope Faces Megapack 2019" folder. Overwrite the files it's asking you to, including the config.xml file (especially this one). Then clear cache and reload skin from FM19 preferences as usual. Repeat this process for all update packs. I no longer have the luxury of time to be searching and converting pictures myself. So if you have a request, please find the pictures on your own, crop them in square shape of at least 178x178 pixels and name them after their unique IDs in-game. Then send me the files either via email or via private message. The pics that pass my criteria will get included in the next update pack. Scope style is created by Stam from fmscout.com but this megapack wouldn't be possible without the help from necjeff and his amazing team. This megapack was made possible in association with the amazing people who produce the DF11 facepacks. THANKS to Jeff for granting his permission to use their top notch collection as base for this megapack. Respect to all contributors of DF11 Facepacks! Scope's 3rd update pack has been made available. It's another big pack that mainly contains the last 2 updates by DF11 plus few extras. Thank you for over 230,000 downloads on our 2019 megapack. Enjoy! Thank you guys for such an amazing hard work that turns this game's fun knob 100 levels up! I got the repack of the game, so in which folder do i put the faces file so that it works ? 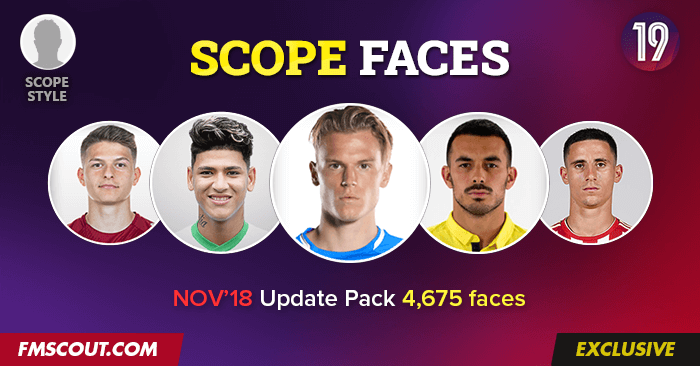 In case you missed it, Scope's 2nd update pack has been made available. It's a rather big pack that mainly contains the last 3 updates by DF11. I've also just synced the download counter with Bitly clicks to the MEGA.nz mirror of the base pack. Thank you for over 170,000 downloads on our 2019 megapack. Enjoy! @RioGilmour: Did you extract the contents of the .zip file? @LLovely: Thanks for the kind words. I'm glad you're enjoying scope. Cant seem to make it work, followed all steps but every time i reload skin it still doesn't turn up. I also don't think there is a config.xml file, if its any use, I'm on mac. Simply amazing Facepack. What a Style. Thank you so much for that great Update! Next update pack will arrive this week. Possibly tomorrow. And it will be quite big (over 12K pics). @Bruno_Carneiro2: Who are you missing in particular? @ilyes92300: I was on my annual break, so I had to skip that month's release. @Saitef: Did you follow all the steps? Some people forget to clear cache and reload skin. @luks_: It would be best if you could send me the pics you want in a consistent format (e.g. square crop) and I'll convert them to scope. @uriel182: Sadly, the default skins are too dependent on cutout style for faces when it comes to match day. You might need to try a custom skin instead. Can you add Sandro Tonali to the next update?? Hello guys! Is brazilian league players inclued in this facepack? Or am i doing it wrong? Thanks! anyone can give me this facepack template? Nice Job! I was another facepack, but this is much better. One question, when I start a match, in the first team preview of the match, the faces hide the numbers of the players. I'll upload the update pack elsewhere too. For those having trouble downloading from zippyshare. Do anyone can make file in random website? Website zippyshare.com refuses to obey and a lot of ppl can't dowload from "zippyshare.com". Hi, I'm trying to download move the files into the folders as instructed; but when "moving" the file, it times out. I'm trying to copy it instead, but it takes 15 hours to copy the file? Help! @stam: It directs me to a site called zippyshare I click the download option and then has me downloading a messenger. I have the main pack it is just the update pack I am trying to download. @Liam123: All there is to explain about the available download options are explained above. Please read that. There's no "messenger" involved. @factor05: Not sure what you mean exactly, but there's nothing I can do about the default dark skin. The faces are of standard size (180x180 pixels) and the outside of the circle is transparent. You can either switch to a different skin or a different facepack. Anyone explain the download link? has you downloading a messenger which I uninstalled straight away; didn't download me the update pack. Thank you! Great work by the way! @LLovely: Thanks man. Glad you like it. @krupek: Grab the latest update pack, it contains config file for the entire megapack. Handcrafted in Symi, Hellas. Page created in 1.17 seconds.